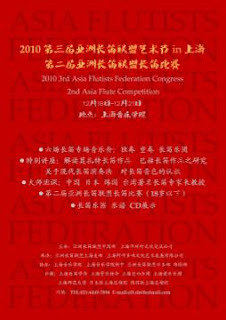 * First Flute Competition related with AFF Sang-Hai congress. AFF is a group for Asian flutist communication and relation of their local culture. 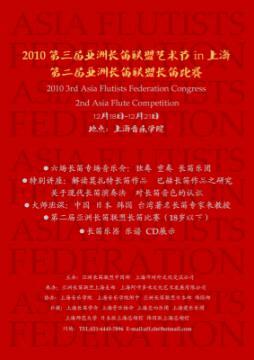 December 2010' Asia flutist's first flute competition is begin. This competition have emerged by AFF Congress. The Congress is held by each host nations in circle way. In this year, AFF congress would be held at Sang-hai, China. Needless to say, Korean flutists participate in this Sang-hai congress, they will have many concerts and some events with Chiness, Japaness and the others. The congress can meet you in December 18th-21th. at Sang-hai. They will participate in the concerts as a Korean AFF members. They're already reknowned flutist in Korea. So, we expect their merry visit China. Especially, the opening day(18th) night, Korean flutist Jee-Eun,Park(Principal flutist of Seoul Symphony)'s mini recital is prepared. We've a plan to follow them like a shadow in this December,And we'll gather news whatever they performs at the congress. As much as possible, as close as possible.